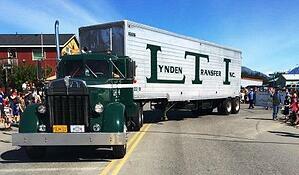 Lynden's restored tractor and trailer that began Alcan service in 1954 has undergone a refresh and update in preparation for a busy travel season. Each year, the iconic tractor-trailer is part of community events and parades throughout Alaska and Washington. A museum showcasing Lynden's history is inside the trailer and is open for tours during the events. Chairman Jim Jansen is often at the wheel in addition to other Lynden drivers. Events include the Colony Days Parade in Palmer, Alaska, the Golden Days Parade in Fairbanks, and the Alaska Trucking Association's Truck Driving Championships in Anchorage, as well as many others. Keep your eye out for No. 27 this summer and check out the museum! 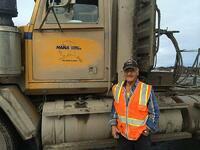 Lynden Legend Lee Burgess came out of retirement to help at NANA/Lynden Logistics at Red Dog Mine for a few weeks. Lee began his career with Lynden in 1957 and was one of the drivers of Old No. 27. “It was fun working with him and very enjoyable listening to the many old Lynden stories at the dinner table,” says Joe Purcell of Lynden Logistics. Lee also attended the SeaTac Summer BBQ in August. Over the past six months, Guy Jansen has worked with Lynden Tank Company, Steven Blankenforth, Blue Star Welding, Maple Leaf Auto and the Lynden truck shop to restore an iconic Milky Way tractor and a set of double 2,800-gallon farm pickup milk tankers dating from the 1950's. The project was completed in time to join more than 700 antique trucks at the American Truck Historical Society Convention in Yakima, WA this spring. "We plan to use #39 and its tankers #75B and #77B to support the agricultural communities in our service area by providing potable water and a hand-washing station at county fairs, FFA, 4-H, and similar events," said Milky Way President Brad Williamson. He encourages Lynden employees to think of otherways #39 can be used to support Lynden customers. This 1956 single-ax Kenworth tractor and double single-axle tankers picked up milk at the Whatcom County dairy farms during the period when the industry was transitioning away from truck tanks to semi-trailers. Each single tanker picked up milk locally and was brought back to Lynden where they were trained up as a set of doubles and pulled through the Darigold plant in Lynden, WA to be topped off. They were then hooked to #39 to deliver full loads to Seattle area processors. Hub DeJong drove for Milky Way from 1949 to 1989 and spent many hours in the cab of #39. According to Guy, Hub and his family got a chance to see the restored rig and it brought back many fond memories. Several recent news articles have highlighted Lynden's commitment to and support of Alaska's transportation past. We are proud of our roots and enjoy honoring our employees, past and present. Old 27, the truck that first carried goods over the Alaska Highway almost 60 years ago, was on display during an event at Lynden Transport's Peger Road facility. The Jansen brothers and Engine 557 are resurrecting a nostalgic piece of the Last Frontier’s railroad history. Over the next year or more, the historic locomotive will be restored and put back into service, where it will haul passengers between Anchorage and Portage. Photos of the old steam engine being transported to Wasilla for restoration. 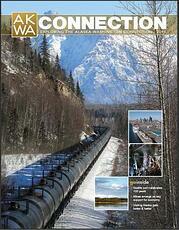 Petroleum Newspapers of Alaska, based in Anchorage, Alaska, recently released "Exploring the Alaska-Washington Connection 2011", the most recent edition of their annual publication. 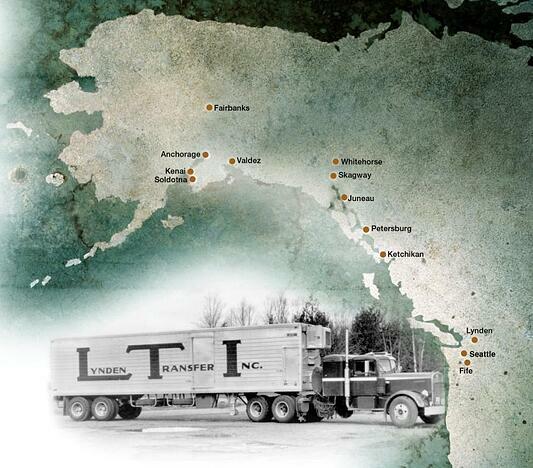 As a multi-modal transportation company pioneering the way between Washington and Alaska for over 50 years, Lynden’s name shows up throughout the magazine. We are proud to serve our customers and communities in Alaska, Washington, and throughout the world. Page 6: Mining activity is also an important lifeline for numerous Alaska and Washington transportation companies, like Lynden Inc. Page 18: Lynden, for example, provides trucking services for Capstone Mining Corp.’s Minto Mine in west-central Yukon Territory. Page 28: The U.S. Department of Energy is introducing wind energy to the nation’s small communities...an effort that Lynden is supporting with an offer to transport wind turbines and towers to 14 communities in Alaska. Page 36: Alaska Airlines, Lynden Inc. and other businesses have taken numerous steps in recent years to reduce their environmental footprints. Lynden's Old #27 is touring Alaska and the Northwest! Old #27 - one of the two Kenworth tractors and original vans Lynden Transfer used in 1954 to start the first scheduled highway service from the Lower 48 to Alaska - will be making appearances this summer throughout Alaska and the Northwest. Come out and see Old #27 at one of the events, or watch for it traveling between appearances!